In the 2018 National Defense Strategy, the Department of Defense announced a shift away from counterterrorism operations around the world to focus on major state power competition. One year on, as the United States seems poised to wind down its military campaigns against non-state actors in Syria and Afghanistan, it is worth examining if and how the Trump administration is implementing this realignment elsewhere. One such potential reorientation is in the Sahel and Lake Chad Basin regions of central Africa, which in recent years had seen a steady expansion of U.S. military presence. Though these areas remain mired in political instability and beset by insurgents returning from the Middle East, the United States declared its intent in early August 2018 to withdraw many of its troops from the area. This post serves as a backgrounder on the armed non-state actors operating in central Africa, and the current state of U.S. operational activity in the region. 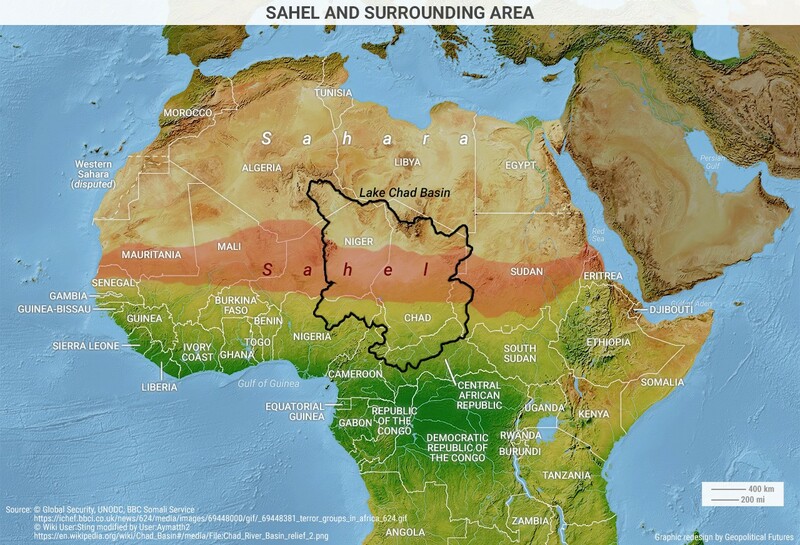 While the borders of the overlapping regions known as the Lake Chad Basin and the Sahel are not completely defined, their composition is essentially as follows: The Lake Chad Basin region comprises the four countries containing parts of Lake Chad, namely Cameroon, Chad, Niger and Nigeria; and the Sahel stretches across the continent under the Sahara, including parts of Senegal, Mauritania, Mali, Burkina Faso, Algeria, Niger, Nigeria, Chad, Sudan, South Sudan, Eritrea, Cameroon, Central African Republic and Ethiopia. For the purpose of concision, this post will focus on the countries with the most significant levels of both non-state militant activity and U.S. troop presence: Niger, Cameroon, Nigeria, Chad and Mali. There are many armed entities currently operating in central Africa, with constantly-shifting alliances and complex motivations. The following is an organizational map of sorts, reflecting a broad overview of the histories, ties and goals of the organized groups with a significant presence in the region. Boko Haram, which literally means “Western education is forbidden,” began as a nonviolent Islamist political movement in Nigeria in 2002. Its overarching goal was to establish an Islamic state in Nigeria. While it operated mostly peacefully for several years, the group grew steadily more violent as militant Islamists used its camps as breeding grounds for jihadi soldiers. Boko Haram’s evolution into a terrorist group culminated in 2009, when it carried out a series of attacks on Nigerian police and government buildings. Though a joint response by Nigerian police and military forces eventually halted the attacks, the clashes resulted in the deaths of upwards of 700 people in Maiduguri, the capital of the northeastern state of Borno. And despite Nigerian authorities’ subsequent execution of Boko Haram’s leader, Boko Haram continued to attack civilian and government targets over the next several years. Nigerian security forces lacked the capacity to contain Boko Haram, so the group’s activities and influence spread throughout the Lake Chad Basin region. Boko Haram carried out numerous mass abductions, including the April 2014 kidnapping of more than 250 Nigerian schoolgirls. From 2013 to 2015, the group’s violent tactics, including raids and suicide bombings, forced 2.3 million people in Nigeria to leave their homes, with a quarter of a million fleeing into the neighboring states of Cameroon, Chad and Niger. Since the beginning of the conflict, it is estimated that Boko Haram has caused the deaths of upwards of 20,000 people. In early 2015, the governments of Chad, Cameroon, Niger, Nigeria and Benin launched a multilateral military effort authorized by the African Union against Boko Haram. Perhaps in response, Boko Haram swore allegiance in March 2015 to the Islamic State. It became known as the Islamic State West Africa Province (ISWAP), though most continue to refer to it as Boko Haram. Many viewed the pledge as a sign of weakness, made as the group gradually lost at least 80 percent of its formerly occupied territory to coalition forces. At the end of 2015, after a series of territorial gains, the Nigerian government claimed that Boko Haram was “technically defeated.” As support for this claim, Nigerian President Muhammadu Buhari alleged that Boko Haram retained only minimal capabilities and influence, and could no longer carry out “conventional attacks” against government targets or population centers. However, critics argue that the Nigerian government has exaggerated Boko Haram’s defeat, and the group’s continued activity seems to prove them right. Boko Haram still carries out violent attacks on both troops and civilians, in both Nigeria and neighboring states. As of April 2018, Boko Haram was thought to have around 1,500 fighters in the region. In 2016, a more moderate segment of Boko Haram split from the group and formed the Islamic State in West Africa (ISWA)—not to be confused with ISWAP, which remains another name for Boko Haram itself. While considered less violent than its parent organization, ISWA is even more entrenched in Nigeria and Niger, operating in a quasi-governmental fashion in territory over which the Nigerian government has lost control. It grants people in its occupied territory protection against Boko Haram, demanding taxes and new recruits in exchange. And throughout its existence, it has still carried out isolated violent operations, including in December 2017, when ISWA militants fired on U.S. and Nigerien forces. It has also adopted other strategies employed by Boko Haram to control local populations, such as kidnapping, abducting more than a hundred schoolgirls in February 2018. In the past six months, ISWA has increased the frequency of its violent attacks. The group attacked a Nigerian military base in July 2018, causing the deaths of upwards of 100 soldiers, and in September 2018 killed 80 Nigerian soldiers in separate attacks on military and civilian areas. ISWA has also increasingly used other violent tactics, including executing two aid workers in the autumn of 2018. Whether driven by the vacuum left by Boko Haram, the death of key leader Mamman Nur at the hands of his own troops in August 2018 or other factors entirely, this increase in violence could signal a shift toward a more militant strategy. As of April 2018, ISWA was believed to have approximately 3,500 fighters in the Lake Chad Basin region. ISIS in the Greater Sahara (ISIS-GS) is the final major Islamic State offshoot operating in central Africa. Formed in May 2015 when it split from al-Qaeda splinter group Al-Mourabitoun (which, as I note below, is now itself part of al-Qaeda’s branch in Mali), ISIS-GS is based in Mali along the border with Niger. While ISIS-GS has pledged allegiance to ISIS, there is little evidence of direct coordination with ISIS itself or its other “affiliates.” ISIS-GS carried out several ambushes in Burkina Faso, Niger and Mali in late 2016, and is thought responsible for the October 2017 ambush in Niger that killed four U.S. soldiers. The group is estimated to have up to 300 active fighters. Jama’at Nusrat al-Islam wal Muslimeen (JNIM), also known as the Group to Support Islam and Muslims (GSIM), is the official branch of al-Qaeda in Mali. Formed in March 2017, it is made up of Ansar Dine, the Macina Liberation Front, Al-Mourabitoun and the Saharan branch of the Algeria-based al-Qaeda in the Islamic Magheb (AQIM). The coalition was responsible for violent attacks on civilian areas in Mali in late 2015 and Burkina Faso in early 2016, and throughout 2017 conducted armed operations against Malian and French military targets. Throughout 2018, JNIM continued its campaign of violence and intimidation against civilians in the north of Mali, in order to discourage them from voting in the presidential election. However, while the attacks may have affected voter turnout, the election itself proceeded without major incident, resulting in the re-election of Ibrahim Boubacar Keita in August 2018. It has been suggested that JNIM militants did not try harder to disturb the election results because the coalition is more focused on combating Western influence than affecting individual elections. As recently as January 2019, coalition partner AQIM claimed responsibility for an attack on a UN camp in Bamako that killed ten Chadian peacekeepers, allegedly perpetrated in response to a visit to Chad by Israeli Prime Minister Benjamin Netanyahu. As of April 2018, JNIM was thought to have approximately 800 fighters. ISIS-GS’s ambush of U.S. troops in Niger last October caught many, including members of the Senate Armed Services Committee, by surprise: No one seemed to be aware that the U.S. had such a significant military presence in the central African region. But at the time, the U.S. military had missions in around 20 African countries, focused on assisting African militaries in countering violent extremism. Since it established its Africa Command (AFRICOM) in 2007, the U.S. military presence on the continent has slowly expanded from around 2,000 troops based mainly in Djibouti, to roughly 6,000 military personnel by the end of 2017, and approximately 7,200 personnel by the end of 2018. In April 2018, then-Defense Secretary Jim Mattis estimated that in Nigeria, Niger and Mali alone, the U.S. had upwards of 1,000 military personnel. As a point of reference, the U.S. currently has 2,000 troops in Syria and around 14,000 troops in Afghanistan. With regard to the domestic legal basis for its military presence in central Africa, the White House and the Pentagon have claimed authorization under Article II of the Constitution (specifically the president’s power as commander in chief and chief executive). Additionally, then-Defense Secretary Mattis claimed the ambushed U.S. forces in Niger were operating under Title 10 “train and advise” authority, and that the 2001 AUMF also authorized their mission to fight militants in the region. These stated legal justifications are significant because they have traditionally been interpreted broadly, and so do not impose a strict legal ceiling on the scope or duration of U.S. troop deployments. However, the Pentagon’s strategic realignment from counterterrorism to great-power threats, announced in the 2018 NDS, should affect these troop numbers. The following subsections are a survey of where the U.S. military presence currently stands in the countries most affected by the terrorist groups discussed above. Over the next several years, the U.S. military presence in Niger rose from 100 to around 800 troops. And despite the mission’s official focus on intelligence and reconnaissance support, U.S. troops were ambushed in October 2017 by ISIS-GS militants, and four U.S. special forces operatives were killed. And in early December 2017, U.S. Green Berets fought off another violent attack, this time from ISWA fighters, indicating that the first ambush had not been a completely isolated episode. The final assessment of the investigation into the November 2017 ISIS-GS ambush, which leaked in early 2018, called for the Pentagon to scale back on ground missions in West Africa, and for particularly risky missions to be vetted by higher-level commanders. And in March 2018, the Pentagon added Niger, Mali and certain parts of northern Cameroon to its list of areas where U.S. troops receive imminent danger pay. Around the same time, in November 2017, the U.S. and Niger finalized a memorandum of understanding, giving the Pentagon permission to fly armed drones out of Nigerien facilities in support of counterterrorism operations. Originally based out of the capital of Niamey, the drone operations would eventually move to a dedicated drone base (Air Base 201) in Agadez. More centrally located, yet more isolated, than the Niamey facilities, Air Base 201 has the potential to provide sustained support for counterterrorism operations in the region. Construction on the base, which is underway, was originally due to be completed by the end of 2018, but the deadline for completion was recently pushed back to mid-2019. Significantly, Pentagon officials said the new drone mission would result in a large increase in the number of U.S. troops in Niger, with around 500 of the 800 troops deployed to Niger as of late 2017 moving to Agadez. In fact, the projected personnel increase had contributed to the State Department’s reluctance to advocate for the drone mission in previous years. As of September 2018, there continued to be 800 troops in Niger, with around 400 in Agadez. In 2015, President Obama announced the deployment of 300 U.S. servicemembers, supported by surveillance drones, to Cameroon. The troops’ mission was to conduct intelligence and reconnaissance operations in support of the multinational task force fighting Boko Haram, which included forces from Nigeria, Niger, Cameroon, Chad and Benin. The U.S. forces are based at the Cameroonian Air Force Base in Garoua, and use drones to gather information about militant activity in the surrounding areas. In late July 2018, General Thomas D. Waldhauster, the head of AFRICOM, submitted a plan to wind down Special Operations missions and reassign troops away from Central and West Africa. The drawdown was to begin in countries like Cameroon, where training efforts are seen to have been most successful. As of August 2018, the United States still had around 300 troops remaining in Cameroon. While U.S. forces provide some assistance to the Nigerian military in support of the multinational coalition fight against Boko Haram, the U.S. has long hesitated to provide direct counterterrorism support to Nigeria and its military, given the latter’s human rights record. However, in May 2014, the Pentagon, State Department and FBI sent a small group of defense and law enforcement experts to the capital city of Abuja to advise Nigerian officials in the recovery of the schoolgirls kidnapped by Boko Haram. The assistance included an intelligence-sharing agreement, though the exchange was limited out of fear that Boko Haram had infiltrated Nigerian security forces. And in April 2018, a group of 12 U.S. soldiers carried out a limited mission to train Nigerian soldiers at a military compound north of Abuja. In May 2014, the U.S. deployed 80 Air Force troops to Chad on a limited mission to assist in the search for the Nigerian schoolgirls abducted by Boko Haram. Mostly Air Force crew members, maintenance specialists and security officers, the personnel used surveillance drones to gather intelligence from territory in northeastern Nigeria. Chad has long been considered a reliable partner in U.S. counterterrorism efforts. As of late 2017, U.S. forces operated a drone base in Chad, from which they cooperated with the Chadian government on counterterrorism operations against Boko Haram. Earlier in 2017, approximately 2,000 U.S. troops participated in military exercises in Chad along with regional forces. In June 2017, the killing of a Green Beret in Bamako, allegedly by fellow U.S. military personnel, drew attention to the presence of U.S. special forces in Mali. The special forces’ mission is generally to combat the efforts of JNIM and other armed groups. The Green Beret operation was intended to provide intelligence about militant groups in Mali to the U.S. Embassy in Bamako, in order to protect its personnel from attacks. The Green Berets were also charged with assessing whether Malian forces should be trained for counterterrorism purposes. The two Navy SEALs under investigation for the murder were themselves deployed to Mali as part of a clandestine mission to provide intelligence and other support to Malian and French counterterrorism forces fighting various al-Qaeda and Islamic State affiliates. In addition to U.S. special forces, there are also U.N. peacekeepers in Mali as part of the U.N. Multidimensional Integrated Stabilization Mission in Mali (MINUSMA). In response to a recent AQIM attack on MINUSMA that resulted in the deaths of 10 Chadian peacekeepers, the U.S. joined France in threatening to push for a drawdown in the peacekeeping mission if the Malian government did not increase its own counterterrorism efforts. In November 2018, the Pentagon announced that it had approved a plan to decrease the number of U.S. troops conducting counterterrorism operations in Africa over the next three years. Specifically, the plan would reduce the number of counterterrorism personnel by around 25 percent by shifting them away from the front lines into strategic and advisory roles, therefore reducing the total number of U.S. forces in Africa by less than 10 percent. Pentagon spokespeople couched this plan as part of the strategic realignment announced in the 2018 NDS. However, there is, as of yet, no evidence on the ground that this strategy is being implemented. Annika Lichtenbaum is a third-year student at Harvard Law School. Prior to law school, she worked on Capitol Hill. She graduated from Brown University with a B.A. in International Relations and Middle East Studies.